In the village of Sirees there lived a poor farmer. 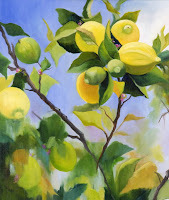 He lived in a small house with two lemon trees in a garden at the front. The farmer and his seven children worked all year round, but money was short. One morning, while they were having breakfast, his wife said, "You look worried. What is the matter?" The farmer replied, "I had a dream last night, and I can't explain it. I dreamt that I had to go to Jerusalem - I don't know why - and had to wait at a certain place by Damascus Gate." "Wait for what?" asked his wife. "That's it," said the farmer. "I have no idea what I was waiting for." He went off to work and by the end of the day forgotten all about his dream. But that night and night after, he had the same dream again. After having same dream three times and consulting with his wife, he decided to follow the dream's instruction. After three days of walking (being poor he couldn't afford to hire a horse or mule), he reached Damascus Gate in Jerusalem. There he stood and waited. People came and went, bought and sold, went to work and came back. Everyone passed by him and still he waited. The farmer waited and waited and waited, but nothing happened. Night came, shops closed, people went home, but still he waited. Next day, same thing happened. On the third day he was still there. On the third night, as the shops were closing, a man approached and said, "I own the leather shop just behind you, and I noticed you have been standing the same spot for the last three days. What is your story?" The farmer told the shopkeeper about his dream, "... and as you can see, I am still waiting for something to happen." The shopkeeper laughed and laughed and said, "Thats the craziest thing I've ever heard. You walked for three days and waited here for three days and nights - just because of your dream?" "Well, yes," now embarrassed farmer said. The shopkeeper laughed even more and said, "Go home. You have already wasted six working days. If everyone left their jobs to follow their dreams, no work would ever get done. Take me, for example. I had the same dream every night for seven nights, and in the dream I saw treasure buried between two lemon trees in a garden in front of a small house in a village called Sss - see, I can't even remember the name! Do you really think I am crazy enough to close my shop and go to that godforsaken place to look for treasure I saw in dream? I..."
Before the shopkeeper could finish, he saw to his surprise that the farmer had disappeared up the road out of sight. ... no heart has ever suffered when it goes in search of its dreams, because every second of the search is a second’s encounter with God and with eternity.